In order to formulate the most effective means of getting rid of termites, identifying the type of critter infesting in your area is one of the essential steps. In Arizona, there are four species that can be found invading and destroying homes. Mostly in the southern portion of Arizona, desert subterranean termites are most frequently found in this state; and, as their name implies, they are able to thrive in dry and extremely high temperature by living in desert plants like cactus. They can severely damage structural timbers in buildings and utility poles. They are attracted to the springwood in timber and often form honey-combed like galleries in the wood. Desert Subterranean Swarmers are 3/8 inches long including their wings and have a pale yellow to brown body color, while Soldiers are tenuous with flat bodies. They are fairly small, which is an attribute that allows them to forage their way through walls through tiny gaps, leading to structural damage. The spread in the population of these types of termites are when they swarm by night and after rainfall, which aids in their survival and formation of new colonies. A typical desert subterranean colony contains roughly about 300,000 termites with queens that can readily break away from their group to form new ones. 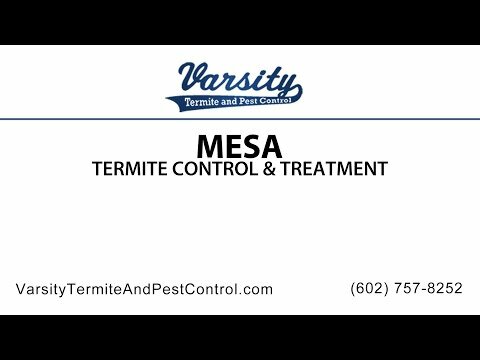 This is the most common and most destructive termite in Arizona. Typically living in deserts but can also be found in low-land rivers and canyons. They can thrive at altitudes 4,000 feet above sea level and otherwise, as well as sand dunes. This difference in altitude affects the months arid-land subterranean termites swarm. Swarmers are about a third of an inch long, wings included, while Soldiers are about a quarter of an inch. Their bodies are dark brown to black in color. Most of the drywood damages in Arizona are because of this specie of termites. They are mainly distributed in coastal regions. Although infestation may take longer compared to subterranean termites, severe structural damages can be attributed to their ability to form multiple colonies, one colony normally composing of 2,000 termites. They are usually transmitted from one place to another as a result of human activity: transporting infected furniture for instance. Swamers and Soldier are half-inch long and whose color is almost reddish to dark brown. The former leaves traces of shed wings and excreta in their wake and swarm during warm weather conditions such as sunny weather or during midday. Unlike subterranean termites, the colonies they form do not need to come in contact with the ground. They live in the same wood that they infest. The pacific dampwood termite is the largest and most significant dampwood termite in United States, particularly attracted to cool and humid coastal areas. This specie infests any type of wood within their territory range. Swarmers are almost one inch long with medium brown to dark brown bodies, and can spread any time throughout the year. They often swarm on humid evening at dusk. Their soldiers are the largest termite in United States, ranging from three quarter inch to 5/8 inches long. The battle against termite invasion can be such an ordeal for homeowners, but arming yourself with knowledge is a key component that would help you become victorious. Once you have identified the specie infesting your house, the approach through which you can begin their eradication will be highly specialized and effective. This is also helpful when you have to choose between homemade solutions or contacting professional Mesa termite exterminators.